Last week, in a Strategic Management class for undergraduate Production Engineering majors, a student asked me about the 3H model. I decided then to address that topic this week, in the context of business growth horizons — a timely subject, considering the difficult period that Brazil (and the world) is going through. 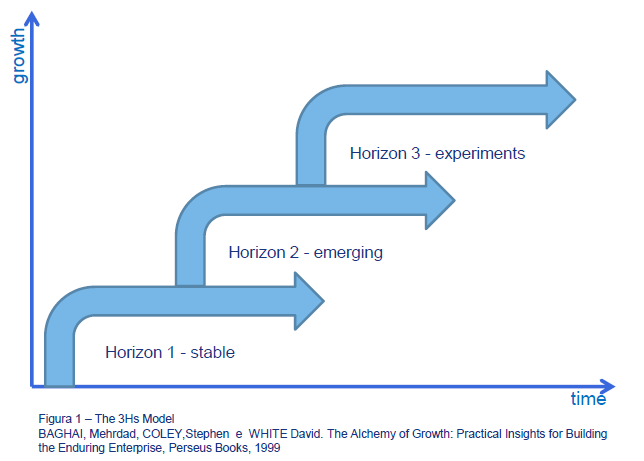 The 3H Model, standing for the 3 Horizons Model, describes a structure developed from a study of how companies sustain growth based on performance management, while future opportunities are maximized. It is a useful model, especially in times of great uncertainty. In their book The Alchemy of Growth: Practical Insights for Building the Enduring Enterprise, Baghai and his colleagues at McKinsey suggest that in order to grow, a company needs to manage projects on three different horizons simultaneously. McKinsey’s three-horizon model encompasses the present moment (Horizon 1), the near future (Horizon 2), and a more distant future (Horizon 3). According to the model, innovative companies program their investment portfolio with these three horizons in mind and continue to develop current business initiatives, all the while prospecting and developing new opportunities. Horizon 1 is related to the core business. Parallel to the BCG Matrix are dairy cows, that is, consolidated, stable, and cash-generating products. It is the present, the day-to-day projects, the reaching for previously established goals. These are the products that no longer require much new investment. Most of the funding is in operation, in keeping things running, and in meeting customer needs. The professional working on this horizon seeks to maximize profit through operational excellence. Horizon 2 shows what will come in the near future (in a few months or years, depending on the market segment). These are emerging products or features. These require more investment in development than in operation, to serve a reduced customer base of early adopters and those appreciating innovations. These are the products and services launched by companies to complete their mix, enter new markets, respond to competition. This horizon requires entrepreneurial professionals who accept the challenge of breaking new business ground. Finally, Horizon 3 is what can be called the “laboratory.” This is where new ideas and concepts are developed and tested. If they are approved and commercially viable, they move on to Horizon 2 and become emerging. At this stage, we need visionary professionals capable of developing strategies. According to the authors, the company needs to be constantly able to develop new business and launch new products / services. The big challenge is to identify which projects should be prioritized and in which way. The idea is to create a filter of projects in development that allow the company to adapt to a changing environment and evolve towards a promising, sustainable future. This creates, as we have said, the need to manage the three horizons simultaneously. Important and complex challenges arise, for the requirements of each horizon are different. Usually, companies that develop one competency rarely manage the others well, even if only because of the constant internal conflicts emerging from the challenge of managing the 3 phases simultaneously. Considering the fact that a new product or service takes time to establish and reach its full potential, the effort is so great that the necessary attention is often not given them. The secret of success lies in trying to reach a balance. Choose and plan well the projects in which you will invest (Horizon 3), validate and develop them with patience, allowing them to grow and leverage their full potential (Horizon 2), and, later, focus total attention on operational excellence (Horizon 1).